Just add the contents of one handy stick packet of green tea powder to your favorite 500 ML bottled water, shake and enjoy the full body, smooth taste. 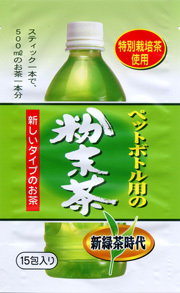 Mass produced bottled tea products (even so-called "small batch") can't compare with the health benefits, rich taste and pleasing color of this excellent quality 100% Shizuoka green tea powder. Each serving is packed in a handy stick foil packet that is ideal for use at home, work or on-the-go. This product comes from a farm that has been awarded a certificate by the Shizuoka Prefecture Government as an “Eco Farmer”. 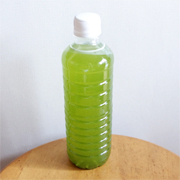 Instructions: Remove a small amount of water from the bottle, add the green tea powder, shake and enjoy. Please Note: If not consumed right away, some of the powder will settle to the bottom or your bottle, so simply shake again if desired.